The LG G8 ThinQ impresses in its performance, audio quality and feature set, and offers up decent camera-taking capabilities and battery life at the same time. It might not stand out as the very best phone of 2019, but if you can find it at a good price, it's certainly worth considering for your next upgrade. LG is back again for another year, ready to take on the might of Google and Samsung and Apple – and with the LG G8 ThinQ, it's coming out swinging. It might lack a fancy foldable screen, or a game-changing quad-lens camera setup, but it packs a lot of performance in a solid design and definitely deserves its place among the flagships of 2019. There are some unique features to talk about here, like the vibrating screen that doubles up as a speaker, and the hands-free gestures you can use to control the phone while you're cooking or cleaning or holding a baby. Combine that with decent camera performance and battery life and the LG G8 ThinQ is worth a look as your next smartphone purchase. The LG G8 ThinQ isn't on sale yet in the UK, so we can't tell you how much it's going to cost or where you're going to be able to get it from, if it will be launched here at all. 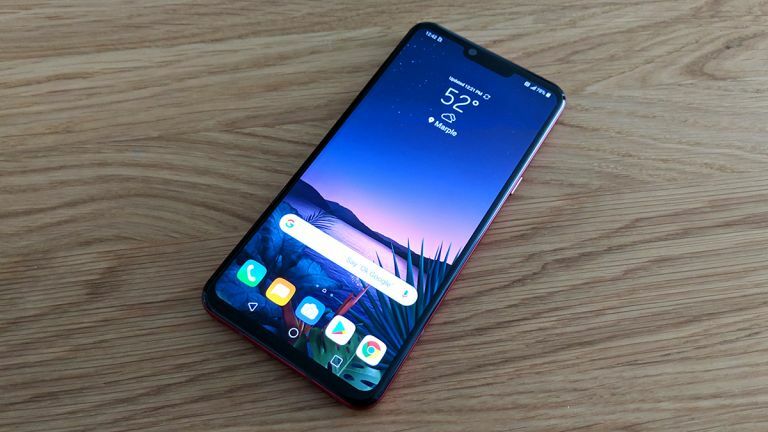 What we can tell you is that it's available in the US for around $840, which is a little less than the Samsung S10 – a rough currency conversion suggests £640 in the UK but that's unlikely to be what LG goes for. Rather oddly, there are two models of the LG G8 ThinQ – one with a dual-lens rear camera, and one with a triple-lens rear camera. Which one you get depends on which part of the world you live in, but we're testing the dual-lens version in the review below. To compete with the Samsungs of this world we reckon LG will have to price the LG G8 ThinQ significantly lower than the standard Galaxy S10, so if the phone does go on sale in the UK, keep your eyes open for discounts and deals – especially from the networks selling the phone with a contract. We've got no surprises to tell you about in the design or build quality department, because LG has been making subtle, stylish, and well put-together electronics for dozens of years now. The LG G8 ThinQ, like its predecessor the LG G7 ThinQ, doesn't rock the boat in terms of its looks but still has plenty of class. We've got a standard-sized notch here, and respectably thin bezels, and a fingerprint sensor around the back (not in the screen, an approach many a 2019 handset is going with). That camera doesn't have a protruding bump either, something of a rarity at the top-end of the market these days. You can pick up the LG G8 ThinQ in grey, black, blue or red – or at least those are the colours LG is making. They might not all make it to your local store. Be warned that the glossy finish is a bit of a fingerprint and dirt magnet too. It's sturdy too, with IP68 dust and water protection that means it can last for 30 minutes at a depth of 1.5 metres or 5 feet. It also meets the commonly used MIL-STD-810G US Military Standard, capable of surviving drops from around shoulder height on to rough surfaces. The LG G8 ThinQ certainly feels solid in the hand, and has that extra bit of premium class that you would expect from a flagship – the ever-so-slightly rounded edges and corners help here, as well as the thin bezels we've already talked about. The volume buttons sit on the top left of the handset as you look at it, with the Google Assistant button underneath, and the power/lock button on the right with the SIM card slot below it. At the bottom of the phone you've got a USB-C port, a single microphone grille, and a 3.5mm headphone jack – so you can carry on using your existing wired headphones. The 6.1-inch, 1440 x 3120 pixel resolution OLED screen is definitely one of the stars of the show here – it's bright, it's sharp, and it works wonders on everything from webpages to movies. With a 564 pixels-per-inch resolution and a 19.5:9 aspect ratio, it's one of the main reasons to buy the LG G8 ThinQ. Thanks to those thin bezels, you can just about get around the interface with one hand, provided you've got relatively large hands (though using two hands to get around is obviously easier). LG has stuck with an old-school notch here, not a new-school hole punch cut out, but we don't really mind that – it's largely down to personal preference whether you'll find it annoying or not. The best displays make using your phone a pleasure, whether you're queueing up podcasts or doing some mobile banking, and the display on the LG G8 ThinQ delivers. It's perhaps not quite as stunning as the best screens put out by Samsung, but it comes very close, and we loved it. HDR10 and Dolby Vision support is included as well, for the apps that can work with the latest standards. Performance-wise you're going to have no complaints with the LG G8 ThinQ. That Snapdragon 855 and 6GB of RAM combination is just about the best you're going to get from an Android phone this year – other handsets might throw in some more RAM, but it's arguable whether it actually makes much of a difference. With the caveat that newly unboxed phones always feel snappier than they do two or three years down the line, we found the LG G8 ThinQ slick and responsive, buzzing between apps and menus with no lag whatsoever. On a couple of more demanding racing and shooting games the LG G8 ThinQ didn't break sweat either: loading times were good, the action was smooth and stutter-free, and you're unlikely to come across a task that the phone struggles with. From the camera app to the web browser (with multiple tabs open), and on to third-party tools like Google Maps and Spotify, the LG G8 ThinQ responded with performance that's as good as we've seen from any phone this year. We now seem to be at the stage where smartphone specs are comfortably outpacing what we're actually doing with our devices. With specs like these under the hood you can rely on the LG G8 ThinQ to keep powering through day-to-day tasks for years to come – that longevity is one of the reasons to go for a top-end flagship rather than saving money on a more mid-range model. In benchmarking scores, the LG G8 ThinQ reached a commendable result in the multi-core tests and less well in other areas, though when you're actually using the phone we don't think you're going to notice any sort of sluggishness or slowing down. The LG G8 ThinQ is an expensive smartphone, but you do get the performance to match. It's worth noting in this new era of 5G phones that the LG G8 ThinQ isn't 5G capable. If you want 5G, you'll have to opt for the similar LG V50 ThinQ instead. We all want a smartphone with a good camera attached, and the LG G8 ThinQ doesn't disappoint – though it doesn't trouble the best smartphone cameras in the business either. The camera app is fast and fluid and comes with some useful options, but it can't match the likes of the Google Pixel 3 phones or the Huawei P30 Pro. Pictures from the 12MP+16MP dual-lens rear camera are sharp and vibrant and full of detail, based on our testing, and don't suffer from any noise problems until the light starts to go down. The AI Cam mode that LG has offered before proves to be actually useful as well, rather than an unnecessary add-on – it can pick out the best settings for a shot when the lighting isn't ideal. We love the wide-angle lens option the LG G8 ThinQ offers – though of course the same feature is available in just about every flagship now. It lets you fit much more inside the frame, and the camera app seemed to cope well in minimising the amount of distortion present at the sides of the picture. The LG G8 ThinQ handled close-ups and landscapes equally well in our testing, and the portrait mode (with added background blur) was more straightforward to use and more effective than on some other phones we've used in recent months. There is a Night View mode here, which can pick out a bit more light in dark shots – it's not quite on Google Pixel levels but it helps, as long as you're keeping the camera very still. Expect good but not great results if you're trying to snap something in the dark. The 8MP selfie camera is perfectly adequate, as you might expect: it did a good job of capturing our selfies and group shots quickly and with decent clarity. Of course you're not going to get shots of the same quality as the rear camera, but it does the job. The LG G8 ThinQ can take some really nice snaps with its dual-lens rear camera. The wide angle lens lets you fit much more in a single photo. The Portrait mode is effective and easy to use. Colours are rich and detail is crisp in most shots. Close ups focus quickly and come out well. The LG G8 ThinQ struggles more in low light – this is the same green from earlier. The AI Cam helps get some more light in the picture, but adds more noise too. With a little more light in a scene, the LG G8 ThinQ can still impress. It's a shame LG didn't put a dual-lens camera on the front of the phone as well, as wide angles can really help for group shots, but it has put a sensor that it calls a Z Camera: it's a time of flight (TOF) sensor you can find on several high-end phones now, which uses infrared light to better sense depth. That means better portrait shots when you're using the selfie camera, but it also enables the hands-free gesture support that the LG G8 ThinQ offers – more on this below. As you can see from the sample shots we've included here, the LG G8 ThinQ can certainly impress with the pictures that it takes – colours are bright and clear, all the details are preserved in the shots, and even the night time snaps come out well. The built-in camera app does come with a manual mode if you want to tweak the settings yourself. LG has packed in a 3,500mAh battery here, which is way up on the 3,000mAh battery it put in the LG G7 ThinQ. That seems to translate into very good battery life too – we're talking around 30 percent left at the end of the day, even after fairly hefty usage. On a couple of occasions when we didn't charge it overnight, we were still able to use it through to lunchtime the following day. Of course battery life tends to degrade over time whether you're buying the LG G8 ThinQ or any other smartphone, but we can only tell you what we've experienced so far – and the LG G8 ThinQ has impressed from a battery life perspective. Running our rather unscientific battery life test – an hour of Netflix at full brightness and 50 percent volume – saw the phone drop down from a full charge to 91 percent (the Samsung S10 went down to 87 percent, by the way). That's a very good result and suggests you can get way above 10 hours of Netflixing from this handset. Audio has always been an area where LG phones have stood out and the LG G8 ThinQ is no different. It comes with a built-in HiFi Quad DAC that ensures high fidelity, clear audio even at the highest volumes over headphones – and we can testify that the LG G8 ThinQ is capable of pumping out tunes through headphones that sounded several notches better than what we're used to. Even on spoken-word podcasts we found the extra crispness noticeable, so – as in previous years – audio quality is one of the reasons to pick LG over its competitors in 2019. If you spend a lot of time using your phone as a jukebox, the LG G8 ThinQ could be for you. The audio features don't end there: the entire 6.1-inch display doubles up as a speaker using some smart vibrating technology that LG calls Crystal Sound. It might come across as gimmicky, but we have to admit it sounds great – music sounds rich and crisp, speech is easy to make out, and even at the highest volumes there's no distortion here. You're never going to use your phone in place of an Apple HomePod or similar, but the LG G8 ThinQ is more than capable of filling a (small-ish) room with good quality audio. It offers more clarity than, say, an Amazon Echo Dot. It even works fine for calls, which is helpful for a smartphone. This kind of vibrating screen tech isn't new, or exclusive to LG, but it's not often used and it helps the LG G8 ThinQ stand out in a sea of similar handsets. You can feel very slight vibrations on the display when it's pumping out audio, but that's par for the course when you're using any phone as a loudspeaker. The security setup on the LG G8 ThinQ is pretty much par for the course for a 2018 flagship, with a fingerprint sensor around the back – it doesn't have the in-screen scanner that a lot of 2019 devices are now offering. The Z Camera we mentioned above does enable secure face unlock though, and you can even use the veins in your hand to prove you are who you say you are. This is one of the main innovations of the LG G8 ThinQ, and it worked okay when we tested it, with a slight delay and a few failures. You might not use it much, but if you need to unlock your phone without touching it – when you're got pastry all over your fingers in the kitchen, for example – it's a handy option to have. That Z Camera also enables what LG is calling Air Motion too. You can use a wave of your hand to answer a call, or pause a song, or set up a range of other shortcuts. We enjoyed playing around with the feature, which works as advertised, it's just a question of how often you'll use it – it's intended for when your hands are busy or messy, so when you're cooking or cleaning, for example. As for LG's own custom take on Android, it sits somewhere between the slick skins offered by Google and Samsung, and the more chaotic alternatives that the likes of Xiaomi and Huawei put together. It's not perfectly polished but it does the job, and we do like the tight integration with Google Assistant – including a dedicated hardware button, no less. Under the LG UX 8.0 overlay is the latest Android 9 Pie, so you get access to the improved Do Not Disturb and Digital Wellbeing tools, plus better battery management and continued refinements to the notification system. As a software whole, the LG G8 ThinQ is mostly fine, and the hands-free features help it to stand out from the wealth of other Android phones currently on sale. The LG G8 ThinQ won't let you down but it perhaps just doesn't stand out enough. It's a speedy, nice-looking handset running the latest Android software and performing very respectably in the photo-taking and battery-conserving departments too. It's waterproof, you can charge it wirelessly, there's a Google Assistant button – what more could you want from a phone? Add to that the occasionally useful Air Motion gestures and the excellent sound quality, whether from headphones or the built-in vibrating screen speaker, and it's a really, really good all-round package. That said, it doesn't really hit the heights of some of its rivals – particularly in camera performance, the screen quality, and the design. The LG G8 ThinQ impresses in all these areas, but other smartphones on the market in 2019 just edge ahead of it. Of course this doesn't matter if the price is right – you might be willing to accept a phone that doesn't give you the very best night time photos in the world if it means saving a couple of hundred pounds. With that in mind, the pricing the LG G8 ThinQ is going to get in the UK will be crucial, and could be a dealbreaker. The LG G8 ThinQ isn't a massive step forward from the LG flagship phones we saw in 2018, but it has enough going for it to seriously compete with the Apple, Huawei, Google, Samsung and other premium phones of 2019.